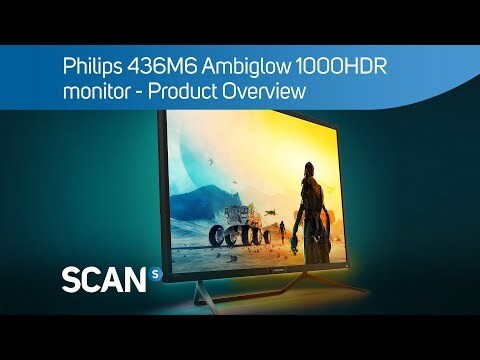 A New Dimension to your viewing experienceThe new Philips Momentum 4K HDR display allows you to experience truly stunning entertainment with immersive Ambiglow lighting. An incredible 43 inch 4K UHD monitor with DisplayHDR 1000 delivers ultra-crisp and vibrant image quality that will make your images and graphics come to life instantly. Featuring technologies such as Quantum Dot and Adaptive-Sync, focused on producing a range of dynamic colours and smooth gameplay. For convenient access and super fast charging, use the USB 3.0 Hub and you can find all your connections through one simple slim and reversible USB 3.1 Type-C cable. Superior UHD Performance Philips displays boasts high-performance panels to cater for UltraClear, 4K UHD (3840 x 2160) resolution graphics. Whether you are an expert requiring extremely detailed professional images for CAD solutions, or using 3D graphics applications or are working on vast spreadsheets, Philips displays will make your images and graphics come alive. Intense entertainment with a halo of light The advanced Ambiglow technology expands the screen by creating an immersive halo of light. The fast processor examines the incoming image content and constantly adapts the colour and brightness of the emitted light to match the image. User-friendly preferences allow you to alter the ambiance to your liking. Philips Ambiglow is particularly suited for watching movies, sports or playing games whilst offering you a unique new viewing experience. See it to believe it colour Quantum Dot Technology is an innovative semiconductor nanocrystal technology that precisely emits light to produce more vibrant colours. LCD monitors with Quantum Dot colour produce a more dynamic range of colours and show the true natural palette of colours in the picture resulting in a see-it-to-believe-it colour. Watch your images come to life VESA-certified DisplayHDR 1000 delivers a dramatically different visual experience. Unlike other 'HDR-compatible' screens, DisplayHDR 1000 produces astonishing brightness, contrast and colours. With the benefit of local dimming and super-high peak brightness of up to 1000 nits, images come to life with advanced highlights, deeper blacks and it renders a fuller palette of rich new colours. Connect devices effortlessly Input lag is the amount of time that elapses between performing an action with connected devices and seeing the result on screen. Low input lag reduces the time delay between entering a command from your devices to monitor, greatly improving play on twitch-sensitive video games, particularly important for playing fast-paced, competitive games. Immsersive virtual surround sound DTS Sound is an audio-processing solution designed to enhance the playback of music, movies, streaming and games on the PC regardless of form factors. DTS Sound enables a virtual surround sound experience, complete with rich bass and dialogue enhancement and maximised volume levels free of any clipping or distortion. Make complex multi-tasking work a breeze Philips MultiView display enables you to experience connectivity in comfort whether at the office or at home. MultiView allows active dual connect and view so that you can work with multiple devices side-by-side simultaneously. You may want to keep an eye on the live news feed with audio in the small window, while working on your latest blog and now you can. Fluid framerates with Philips Technology Gaming shouldn't be a choice between choppy gameplay or broken frames. With the new Philips monitor, it doesn't have to be. Get fluid, artifact-free performance at virtually any framerate with Philips Adaptive-Sync technology, smooth quick refresh and ultra-fast response time. 42.5" Philips 436M6VBPAB 4K Monitor, MVA, 3840x2160, 60Hz, Adaptive Sync, 4ms, 50M:1, 1000cd/m², VESA, DP/mDP/HDMI/USBC is rated 4.0 out of 5 by 1. Rated 4 out of 5 by Magash from Quantum dot and HDR are lovely to view. Sharpness is not as good as i would have hoped. Purchased for £559 Upgraded to the Phillips Momentum from a Iiyama 40" 4K screen. I use this only for entertainment purposes on a PC. The quantum dot combined with HDR is Excellent looking and the realism as well as colours in lighting etc is FAR superior on this Phillips than the Iiyama 4K panel (I loved the iiyama I had until i put it side by side with this and I gasped at the difference inn colour and vibrancy) . The Iiyama on the scan website Has one important edge. The sharpness. The Phillips is better in every way over any other 4K monitor I have used due to the quantum dot and HDR, except that its a slightly softer image than the Iiyama as the iiyama was 4K and I used xres tecchnology to enhance the already sharp 40" image, which made the iiyama very sharp. The Phillips image is spread over a bigger screen of 43" and so the image is naturally stretched. The Sharpness setting on the Phillips is kinda useless above 60/100 as it starts looking blocky and grainy. I keep it at 60. If you are coming from a 4K monitor smaller than 40" then you will notice the softer image and you may not be happy. But if your coming from 2K / 1440p then this image will be crisp for you. Overall this Phillips monitor is better is every way except its 5 - 10% less sharp than the other 4K smaller monitors (40" and lower) and you Must sit at least 60cm or so away from the screen to get the best picture or at least a full adult arm length away. After using it a week I have come to find that the benefits of Quantum dot, HDR, and a very good feeling response time outweighs the 5 - 10% softer image ( Its still sharp enough ) and software that makes use of the quantum dot and HDR makes the image quality Superb and in balance with my expectation of what QD and HDR 1000 was supposed to be. Quantum dot makes a big difference to the panel in vibrancy. HDR is REAL and makes lighting images etc look brilliant, although be aware that the other colour settings in game will also be more realistic and less vibrant in areas that wouldn't realistically be vibrant and bright so that the HDR really stands out. The 4K is slightly softer image than id like The response time feels fast. it says 4ms but id say it feels faster as I had a 3ms response time before this and this Phillips feels faster. Ambiglow is cool but kind of pointless for me. Do note: Sometimes on a black screen when PC isnt active you can see the backlight (white) on the screen if its on but when the monitor diplays images videos software etc you cannot see any problems and image is lovely. But when pc is being used and active blacks are fine with no light seeping. My background is black and its perfect. Also once or twice when switching HDR on / off in certain games etc 1/3 of the left screen goes darker like its having some sort of issue which seems like a common theme for some people as I seen this happen in some you tube reviews, but Off and on, on the remote resets the screen lighting to be normal again. But its something to do with HDR only and maybe not all will do that im not sure. I got this for image and eye candy only and I got that mostly. But there are other areas I mentioned where I feel the quality and fine tuning of this monitor are not in par with what the image gives you and so If your affter image candy and a good response time go for it. But if you are after a super sharp image then this might not be for you compared with some other monitors. But for the Price this is the best I can find at the moment until next year probably. Thats everything ive experienced with this monitor. Hope it helps. Response time 4ms or 11ms? The tech specs for the monitor state a 4ms response time, however in the video of the product it is stated as 11ms response time. Could you please confirm which is correct?